XeonBD Review 2019: Is XeonBD a Good Hosting? XeonBD offers one of the widest ranges of hosting products at some of the lowest prices. But don’t be fooled by the low prices that are still underpinned by fantastic infrastructure and superb customer support. Hosting provider XeonBD is based in Dhaka, Bangladesh and has been providing hosting services to customers at home and abroad since 2005. Having been established by experienced founders, this company has kept the culture going with an educated and experienced workforce of engineers. Their philosophy is to be like a long-term partner to their business customers. The best thing about XeonBD’s hosting is their range of products and features that offer something to nearly everyone. All the Linux machines run on the optimized CloudLinux operating system, and even the cheapest plans come with unlimited subdomains and unlimited email, add-ons, and FTP accounts. They also provide software support for frameworks such as PHP, CGI, Perl, and Python. In terms of security, they offer a range of basic free or premium SSL certificates, spam protection, and the Immunify360 firewall. Linux products also come with the powerful cPanel and script installer. Windows products come with the Plesk Onyx control panel. You also get ASP.NET, a dedicated IIS application pool, Microsoft SQL Server and myLittleAdmin. The cost of hosting with XeonBD is incredibly low, and they might just have some of the cheapest hosting plans in the industry. The prices for shared hosting that runs on semi-dedicated resources will really make your jaw drop. The resources start out a bit limited, but – considering the incredible prices – you can’t expect anything else. Most hosting plans with yearly or longer billing come with a free domain for the first year, and the cheapest free domain plan basically costs per year what just a domain would. The more expensive plans offer short-term billing options and come with a free SSL certificate. All shared hosting plans are backed by a 30-day money-back guarantee. The VPS and dedicated server plans can get quite costly and aren’t backed by the money-back guarantee, although they still offer good value for money. XeonBD offers 24/7 customer support via their help desk, and they can be reached via live chat, multiple phone lines, and tickets/emails. They also provide a more-than-decent knowledge base that covers all the essential topics. The superb support service is provided by extremely courteous and helpful staff who solve your problems in a timely manner. With some of the most competitive prices, a huge selection of hosting products and rates, three global data center locations, and partnerships with some of the best technology industry names, there is very little reason not to make XeonBD your hosting partner. 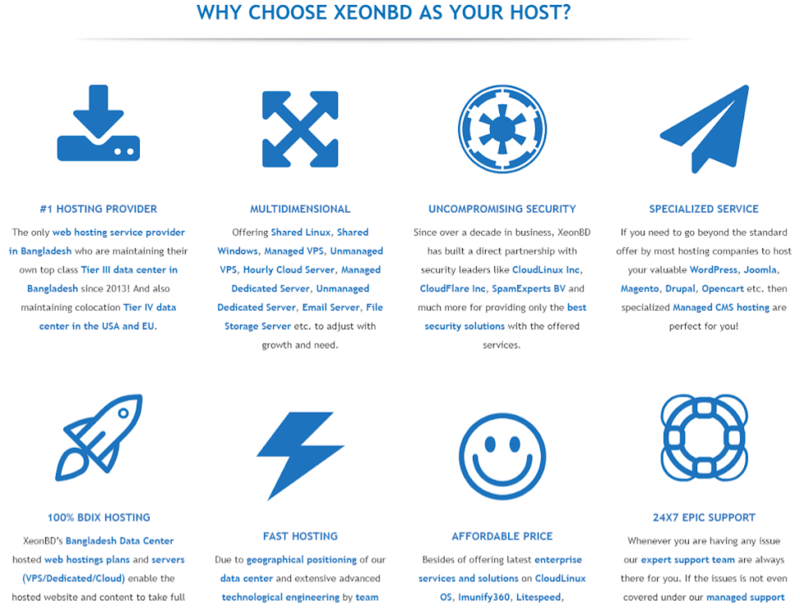 Wondering how XeonBD stacks up against other Web Hosting companies? Enter any other Web Hosting company and we will give you a side-by-side comparison.